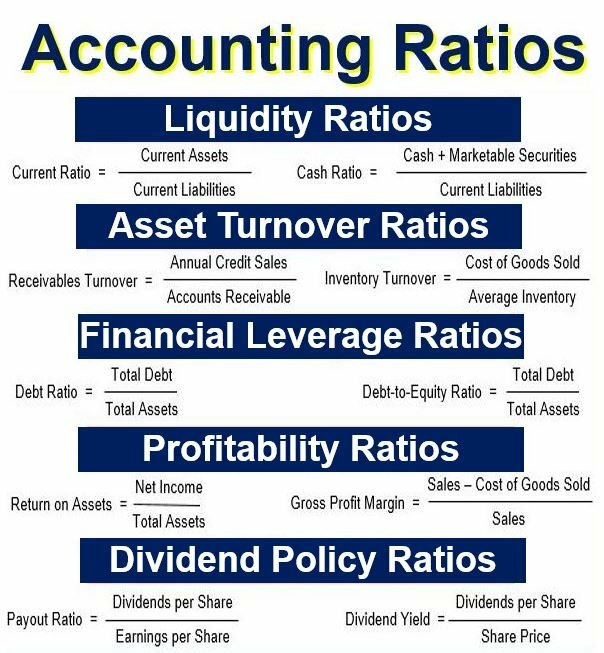 Accounting ratios, or financial ratios, are comparisons made between one set of figures from a company’s financial statement with another. We use accounting ratios to determine whether a business can pay its debt and how profitable it is. Additionally, accounting ratios are used to predict whether a company is likely to go bankrupt soon. Overall, the aim when studying these ratios is to analyze trends. Accounting ratios are indicators of a commercial entity’s performance and financial situation. We calculate the majority of ratios from data that the firm’s financial statements provide. Financial ratio sources could be the balance sheet, income statement, or statement of cash flows. The statement of changes in equity is also a source. The data comes from either within the company’s financial statements or its accounting statements. There are many different types of accounting ratios. They tell us how healthy/unhealthy a company is. Apart from determining whether a firm can meet its financial obligations, they tell us how profitable it is. Furthermore, we are better able to predict whether it will thrive or sink in the near future. The term ‘Financial ratios’ has the same meaning as ‘accounting ratios.’ They are comparison calculations we make to see how well a commercial enterprise is faring. Therefore, they are a vital metric for a company’s senior management and potential investors. – Absolute Liquid Ratio is the relationship between absolute liquid, or super quick current assets, and liabilities. – Activity Ratios measure a company’s ability to convert different accounts within its balance sheets into cash or sale. – Asset Turnover Ratios measure the efficiency of a commercial entity’s use of its assets in generating sales revenue to the business. – Current Cash Debt Coverage Ratio measures the relationship between net cash that operating activities provide and the average current liabilities of the firm. – Current Ratio or Working Capital Ratio measures a business’ ability to pay short- and long-term obligations. – Debt Service Coverage Ratio, also known as DSCR, is the ratio of liquid cash available for debt servicing to interest, principal, and lease payments. It measures a firm’s ability to service its current debts. We determine this by comparing its net operating income to its total debt service obligation. – Dividend Policy Ratios: the most common are Dividend Payout Ratio, Dividend Yield and Dividend Cover. The Dividend Payout Ratio tells us how well earnings support dividend payouts. – Financial Leverage Ratios measure the overall debt load of a commercial enterprise and compare it with the assets or equity. – Liquidity Ratios tell us what the cash levels of a firm are. Additionally, we can learn whether it can turn assets into cash to pay off debts and current obligations. This type of ratio tells us how well a company can pay off both its current liabilities as they become due. – Profitability Ratios are measures that tell us how well a company is performing. In other words, it tells us whether the business can generate profit. – Quick Ratio or Acid Test Ratio measures a firm’s liquidity and ability to meet its financial obligations. Business people view it as a sign of a business’ financial strength or weakness. We can express ratios as numbers or percentage values. We quote some ratios, such as earnings yield, as percentages. These ratios are the ones that are always less than one. We typically quote ratios that are more than one in decimal numbers (1.0, 1.1, 1.2, etc.). An example is the P/E ratio. You can take any ratio’s reciprocal. In other words, if that ratio is above one, the reciprocal will be below one, and vice versa. Sometimes the reciprocal may be easier to understand. Why do we use accounting ratios? – to compare one industry with another. A ratio is only useful if we benchmark it against something else, like another company or past performance. This video looks at the top 10 most common financial ratios that appear in accountancy exams.